Pesto is a such an easy thing to make and is so delicious that I don’t know why more people don’t make it. 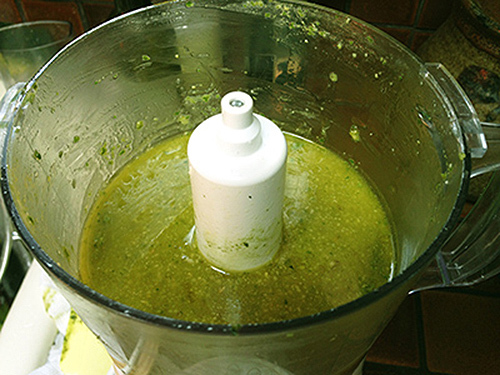 This summer I made fresh pesto with my mini food processor which I then froze for later use. I put some on pasta the other night and all the flavors of that fresh basil burst in my mouth just like when I first made it. 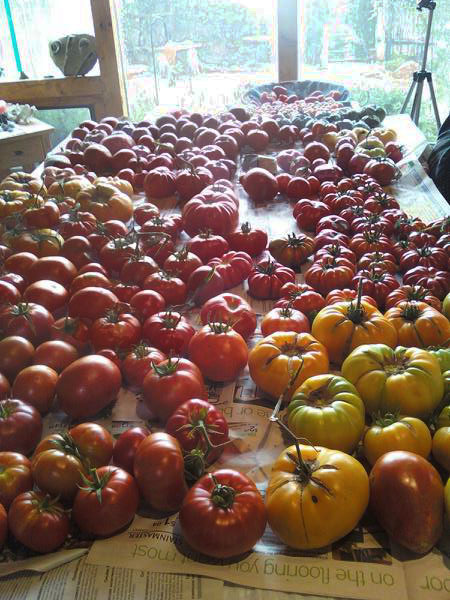 To make fresh pesto you can either grow your own plants or buy plants to use. I cut off all the leaves except the biggest to use in pesto. I keep the bigger leaves to add when making a pasta sauce to cook down. I do not use the flowers if there are any, as I think they give the pesto a slightly bitter taste. I use Italian or Genovese basil to make my pesto and after I cut the leaves off, I soak the basil in bowl of water to freshen it up for about 15 minutes. Put olive oil, sea salt, pine nuts, and garlic cloves into a blender or food processor and blend well. 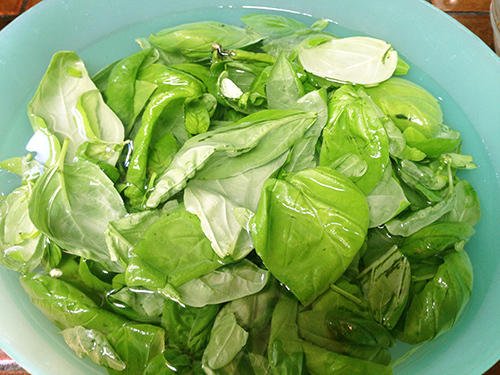 Drain your basil leaves and add them and blend till smooth and creamy. If the mixture is really thick add more oil a little at a time till smooth. It should not look like thick chopped spinach but be a little thinner and smooth consistency! 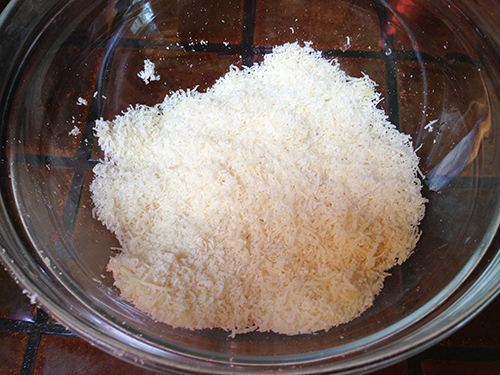 Then add the grated cheese and blend again. Notice how it is finely grated and light and fluffy. Finished pesto ready to freeze for later use. Put olive oil, sea salt, pine nuts, and garlic cloves into a blender or food processor and blend. 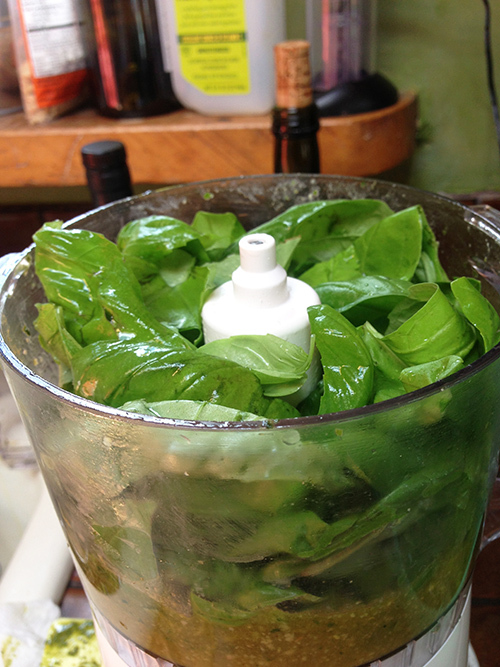 Drain your basil leaves and add them and blend till smooth and creamy. If the mixture is really thick add more oil a little at a time till smooth. It should not look like chopped spinach but be of thinner consistency! Then add the grated cheese and blend again. If you are not going to use it right away, put it in a bowl and add a small amount of oil on top of it to help keep the pesto from oxidizing. This won’t hurt the flavor but will turn the pesto into a shade of Army green instead of its bright beautiful green color. 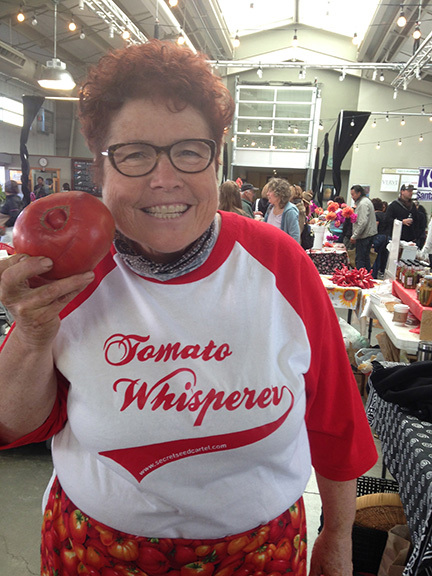 I like to put it in freezer bags, taking as much of the air out of the bag as possible and lay it flat in the freezer. Be sure to not add too much to each bag as you want it thin enough to break off chunks of it later to use with your pasta. 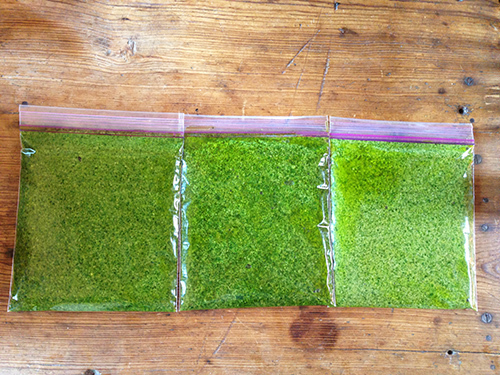 Never microwave the frozen pesto to soften it. I like to put it in a bowl on top of the stove (next to the pot of boiling pasta) where it will start to soften up. Then after I drain the pasta, I pour it over the pesto. The hot pasta will melt the pesto, then toss it to coat all the pasta evenly. Add a little grated Parmigiano-Reggiano on top and enjoy.